In today’s increasingly competitive market place it is important to find efficient and effective means for streamlining the real bread and butter of your practice – namely, direct restorative dentistry. While many people have some level of knowledge regarding glass ionomers, very few are aware of the advances that have been made since this category first came on the market over 30 years ago. The versatility, vastly improved esthetics, and ease of use over the earliest generations have made this a reemerging and rapidly growing area of dentistry. In fact, some recent studies have shown that properly placed posterior glass ionomer restorations may actually offer a superior clinical life span to direct composites. Dr Mark Pitel discusses the properties of glass ionomer cements and how the materials have evolved in recent years. 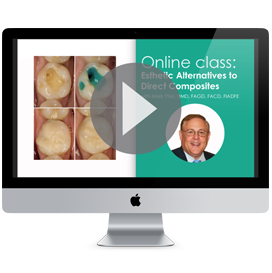 He outlines how the features such as adhesion, biocompatibility, easy placement, anti-cariogenicity, and resin modifications make the material a good solution in a number of restorative situations. Techniques and tips are described on how to achieve esthetic and durable results with glass ionomer cement in a wide range of restorative conditions in comparison to composites available on the market. Clinical cases are shown and academic evidence to support these are also shared.